My father was always able to get a practical job done in the least expensive way. It wasn’t always pretty, but it usually involved hard work and making do with whatever tools were at hand. One of the many things he did in the garden of our family home was to create a long concrete path next to the washing line. He did this by mixing cement with water from a garden hose in a wheelbarrow . 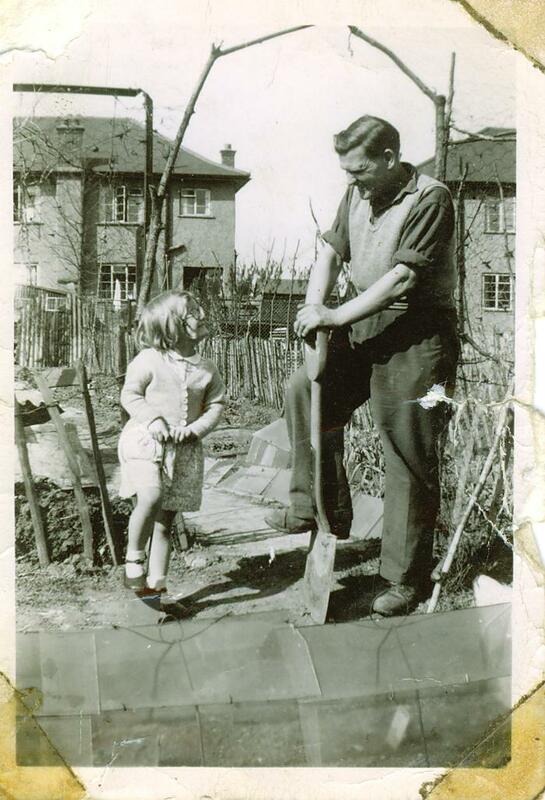 When I watched him work in our garden, usually in his blue coveralls and Wellington boots, it didn’t occur to me that his steady industry was teaching me how to work. He never hurried, he took regular breaks for cups of tea, he always involved us children whenever we showed interest, and he got a lot accomplished. Most of the time he was quite cheerful, too. That garden path was not just a necessary means to an end, it was a lesson in life. Before you can walk a path, you sometimes have to build it yourself. You also have to involve young people and keep your sense of humour. A few years ago, I built a path in my own back yard. I figured out how to do it by researching online, but I discovered that I couldn’t do it all alone. I ultimately got some help from a friend, Clair, who helped me with the heavier paving blocks. That’s another lesson I learned from building a path. Admit when you can’t do something alone. I’ve had to be independent in many aspects of my life, and I’ve always resisted seeking help. I didn’t want to bother people. It turns out, though, that people don’t mind being bothered. In fact, they like it when you ask for their help. When my husband had been ill for a few years and had become unable to walk, my brother Phil and his wife, Audrey, came to visit. As soon as they arrived, they asked how they could help. There were quite a few things that were beyond my ability to do alone, and they did them all. One of the things they did was to make the front path to my house wide enough for the wheelchair. As I watched them digging in the dirt and moving paving stones around with a wheelbarrow, I had a sense of comfortable familiarity. The rhythm of their work was like my dad’s and my own. Their willingness to roll up their sleeves and get the job done, is something we all share. Above all, though, the members of my family always come through for each other when the need arises. The “path of life” is often a metaphor for changes in our lives, but the real concrete paths in my life have also, sometimes, been lessons in love.